Meet awesome dog, Poppy, from Easy Home Made. Poppy not only is awesome because he sports some rather cool shades, but also because he has healthy teeth and gums and fresh breath. Poppy gets his teeth cleaned at home, and this regular activity helps reduce plaque and prevent dental disease. Here at Homestead & Survival, we’re big fans of brushing our dogs teeth because we’ve learned that regularly brushing extends the time between cleanings from a veterinary professional. Much like people’s own routine visits to the dentist, a professional cleaning from the vet involves close inspections of the teeth, gums, and mouth, plus scaling and polishing of the teeth. Because dogs can’t be expected to keep their mouths open wide and say “ahh,” they are given anesthesia so the vet can easily complete the dental cleaning and oral examination. Professional dental cleanings are expensive, especially when they’re needed every few years; that is, more or less depending on the dog’s diet, breed, and genetics. While we’ll happily pay our dog’s dental cleaning bill, our biggest concern is the anesthesia. There’s always is some risk to it, even then though vets complete the proper lab work before the cleaning to make sure the dog is healthy to undergo the anesthesia. As dogs age and health issues begin to emerge, anesthesia becomes more of a risk. So by regularly brushing a dog’s teeth early in life, the dog not only will have healthier teeth and gums, but also will require fewer professional cleanings – and that means fewer times under anesthesia and a reduced number of dental cleaning bills. 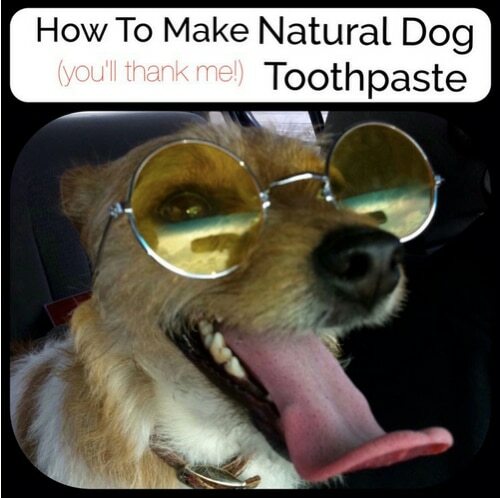 If you want to begin brushing your dog’s teeth, then try out Easy Home Made’s recipe. All the ingredients are natural, with no chemicals that you can’t pronounce. When you get started, you can apply the toothpaste to a doggie toothbrush like this one here (they in different sizes for various breeds), or just dab some paste on a soft cloth and gently massage on all the teeth and the gums.